The Recurring Donation tab is where you will go to load all subsequent donations into your database. 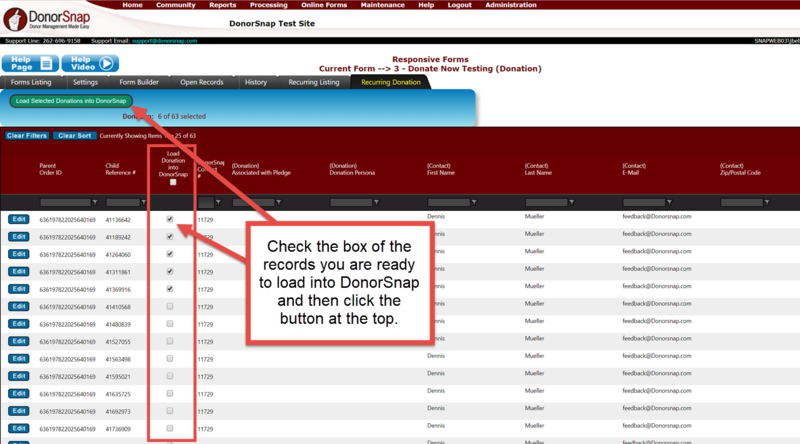 Any changes that you make to a recurring donation record on this screen will be kept for the subsequent donations that are processed by goEmerchant and come back to DonorSnap. For example if you forgot to select a campaign code in the original donation, just edit the subsequent donation from this tab, and all future donations for that schedule will also have the new campaign code selected. By clicking the edit button you can change all of the donation fields currently on your Responsive Form. You can also change which contact the donation record should be assigned to. Click the Change Contact button and select the new contact.